Animal Welfare bracelets raise awareness for animal care. These are a great fundraiser for shelters, pet clinics and rescue missions. 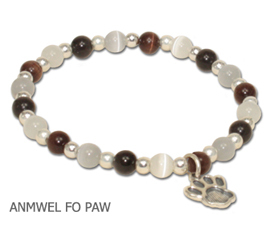 Black, white, brown and gray fiber optic beads with a Paw charm and spacer beads on jeweler’s elastic. Each bracelet is individually packaged with a card listing animal care tips. Available with sterling silver or silverplate charm.